Cecilia Rouse was awarded the 2017 Bell Award from the American Economic Association’s Committee on the Status of Women in the Economics Profession, which "recognizes and honors an individual who has furthered the status of women in the economics profession." Lisa Barrow has published a short "Interview with Bell Award Winner Cecilia E. Rouse" in the CSWEP News (2017, II, pp. 1, 12-13). I was struck by two bits of life advice offered by Rouse, worth mulling over as the new year approaches. Barrow: "Two things that I hear you say repeatedly are “careers are long” and “there are only 24 hours in a day.” Can you elaborate on what you mean?" Rouse: "These are probably my favorite and (from my perspective) most profound pieces of advice for women … and really everyone. By `careers are long' I mean that one cannot answer all questions in one single paper or dissertation. I so often see students struggle to bring their papers under control as they attempt to answer every question that might come up in the course of their research, which can often lead them away from the original question of the paper. Of course, some evolution is good and healthy. But I also remind students that if they choose a job that involves research, they will have a lifetime to address many questions. In fact, I also do not believe that any one paper is ever dispositive so it’s actually quite fruitless to try. Rather, we advance our understanding of the world by putting together pieces of evidence from many different places, researchers, and contexts and seeing the picture that emerges. "As for there being only 24 hours in the day, this is the piece of advice about which I feel the strongest, mostly because I see people trying to elude it every day. The saying itself should actually be quite familiar to economists as it’s really just a statement about a time constraint. But as we push with ever-improving technology and the illusion of multi-tasking, we believe that we can somehow beat it. However, while we can ease an income constraint by giving an individual more money, we have yet to find a way to give anyone more time (not that we don’t try!). This is really the hardest, most intractable of constraints. And it basically means that we all have to make choices— real choices. One cannot `have it all' (which is antithetical to the notion of a budget constraint) but one can maximize one’s utility subject to the time reality. Fundamentally this means that it is critical to identify our highest priorities and do them (and attempt to do them well) and learn to say no to others demands. One cannot do everything and it’s useless to try." Barrow: "Any last pieces of wisdom?" Rouse: ;"Take time to enjoy the small moments of life. One of the highlights of my afternoon is dark chocolate with coffee." The other day I found myself, as one does, reading speeches given 50 years ago by Edward Levi, who was then the president of the University of Chicago. Here are some thoughts from "The University and the Modern Condition," which was delivered to the University of Chicago Citizen's Board on November 16, 1967, and reprinted in his 1969 collection Point of View: Talks on Education (magically available via Google Books). It is both comforting and disheartening that many of his comments could be delivered essentially unchanged by a speaker a half-century later. "Our society is flooded with communications. The acceptance of myths and aphorisms is not a new phenomenon, of course. But the increase in the printed word, the rise in literacy, the development of new means of communication all give rise to new burdens as well as opportunities. George Bernard Shaw had over his fireplace the motto, `They say. What say they? Let them say.' Instead of this skepticism, we ask: `How often do they say it?' and `How many say it?' The test of an idea becomes the frequency with which it is repeated. This is not a test which promotes rational discussion. It is a setting in which the waves and tides of popular thought, the acceptance of a false inevitability as to points of view, have magnified importance. It is a climate, and this is particularly true in matters dealing with education, where it is axiomatic that any poor idea will be catching. Popular discussion has never been enough, and it is tragic for a society if that is all the discussion there is. "Perhaps, then, one should ask, `What is the service of this university?' The answer is traditional and old-fashioned. Its greatest service is in its commitment to reason, in its search for basic knowledge, in its mission to preserve and to give continuity to the values of mankind's many cultures. In a time when the intellectual values are denigrated, this service was never more required. ... The university's role is not based on a conception of neutrality or indifference to society's problems, but an approach to the problems through the only strength which a university is entitled to assert. It is a conservative role because it values cultures and ideas, and reaffirms the basic commitment to reason. It is revolutionary because of its compulsion to discover and to know. It is modest because it recognizes that the difficulties are great and the standards demanding." "Comfort the Afflicted and Afflict the Comfortable"
"The job of a newspaper is to comfort the afflicted and to afflict the comfortable." I first heard that saying back in the mid-1980s, when I spent a couple of years as an editorial writer at the San Jose Mercury News. The saying tended to come up in a situation where the newspaper had written something that offended a person with some authority and pull, like a local politician or business executive, and we felt a need to stiffen our backbones. But even within the walls of the newspaper, it seemed to me widely recognized that the amounts of both comfort and affliction provided were often rather small and limited. And of course, grim and straight-laced folks like myself wondered how actual straight reporting of the news fit into that slogan. Th' newspaper is watchin' most iv us fr'm th' cradle to th' grave an' befure an' afther. Whin I was a la-ad thrippin' continted over th' bogs iv Roscommon ne'er an iditor knew iv me existence nor I iv his. ... Nowadays th' larceny is discovered be a newspa-aper. Th' lead pipe is dug up in ye'er back yard be a rayporther who knew it was there because he helped ye bury it. A man knocks at ye'er dure arly wan mornin' an' ye answer in ye'er nighty. `In th' name iv th law I arrist ye,' says th' man seizin' ye be th' throat. `Who ar-re ye, ye cry?' `I'm a rayporther f'r th' Daily Slooth.' says he. `Photty grafter, do ye'er jooty.' Ye're hauled off in th' circylation wagon to th' newspaper office, where a con-fission is ready f'r ye to sign; ye're thried be a jury iv th' staff, sintinced be th' iditor-in-chief an' at tin o-clock Friday th' fatal thrap is sprung be th' fatal thrapper iv th' fam'ly journal. Th' newspaper does ivrything f'r us. It runs th' polis foorce an' th' banks, commands th' milishy, conthrols th' ligislachure, baptizes th' young, marries th' foolish, comforts th' afflicted, afflicts th' comfortable, buries th' dead an roasts thim aftherward. They ain t annything it don't turn its hand to fr'm explainin' th' docthrine iv thransubstantiation to composin' saleratus biskit. Ye can get anny kind iv information ye want to in ye'er fav'rite newspaper about ye'ersilf or annywan else. What th' Czar whispered to th' Imp'ror Willum whin they were alone. how to make a silk hat out iv a wire matthress, how to settle th' coal sthrike, who to marry, how to get on with ye'er wife whin ye're married, what to feed th' babies, what doctor to call whin ye've fed thim as directed,--all iv that ye'll find in th' pa-apers. They used to say a man's life was a closed book. So it is but it's an open newspaper. Th' eye iv th' press is on ye befure ye begin to take notice. Th' iditor obsarves th' stork hoverin' over th' roof iv 2978 B Ar-rchey Road an th' article he writes about it has a wink in it. `Son an' heir arrives f'r th' Hon'rable Malachi Hinnissy,' says th' pa-aper befure ye 've finished th' dhrink with th' doctor." The media people who have repeated the slogan of comforting the afflicted and afflicting the comfortable might reflect on the irony of repurposing an attack on the media to serve as a defense of the media. Throughout my lifetime, China has been the most populous country in the world. 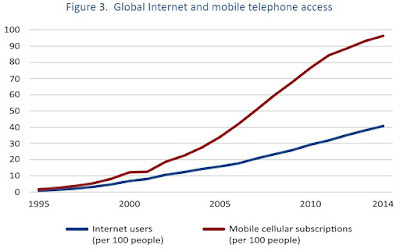 But India has nearly caught up, and should overtake China in the next year or so. Here's a figure of population totals for the two countries. 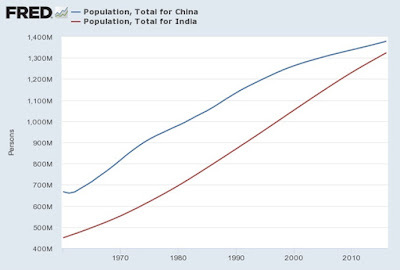 Back in 1970, China's population was 818 million, while India's was 553 million. By 2000, the gap had narrowed to "only" 150 million or so, with China's population of 1,262 million and India's of 1,053 million. By 2016, the gap was down to about 60 million, with 1,378 million in China and 1,324 million in India. 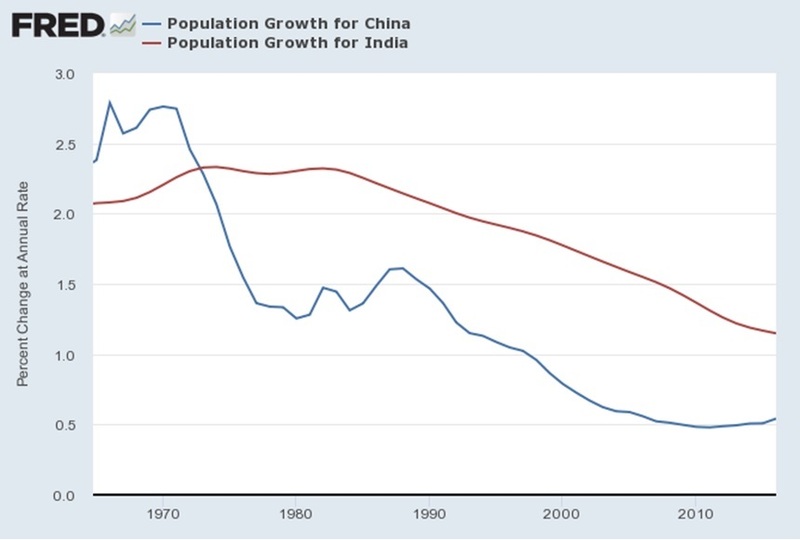 Population growth rates have slowed substantially in both China and India, but India's population growth rate has been higher since the mid-1970s (after China adopted an extremely aggressive family planning program in the early 1970s). The population growth rates have converged somewhat, but India's annual rate of population growth remains about 0.5% per year higher, so it closes the population gap by about 6-7 million people each year. 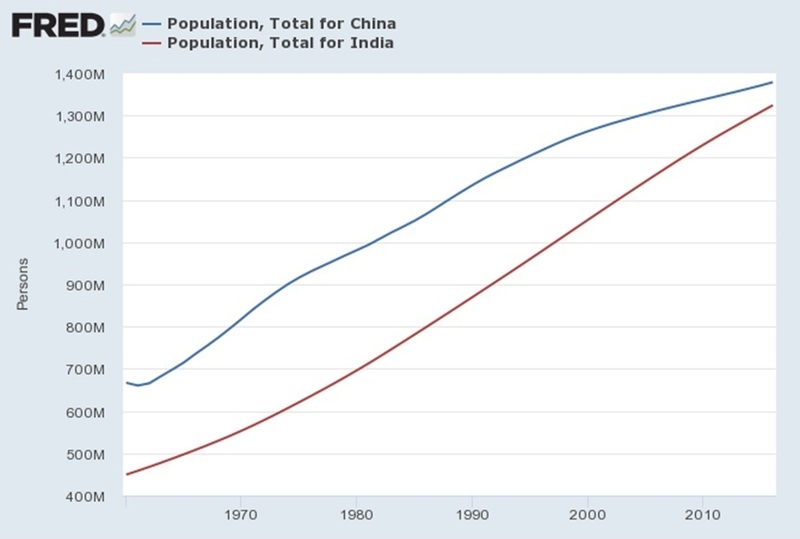 In about a decade, India's total population will overtake that of China. 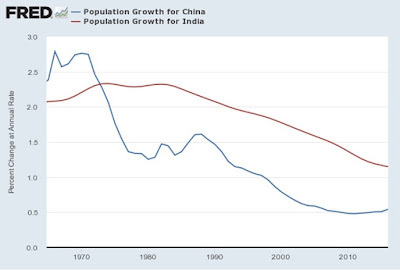 The total population figures mask another difference: China is aging much more rapidly than India. For example, here's a figure showing the "age dependency" ratio, which is calculated as the number of elderly divided by the working population. 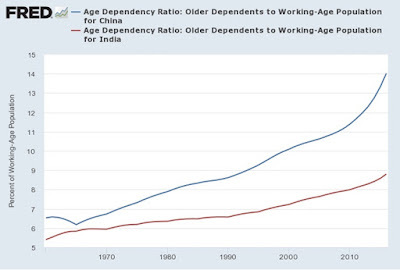 Thus, in China the age-dependency ratio has already reached 14% and is rising sharply, while in India it is at 8% and rising more slowly. As the saying goes, China seems likely to face the problem of getting old without first having become rich. 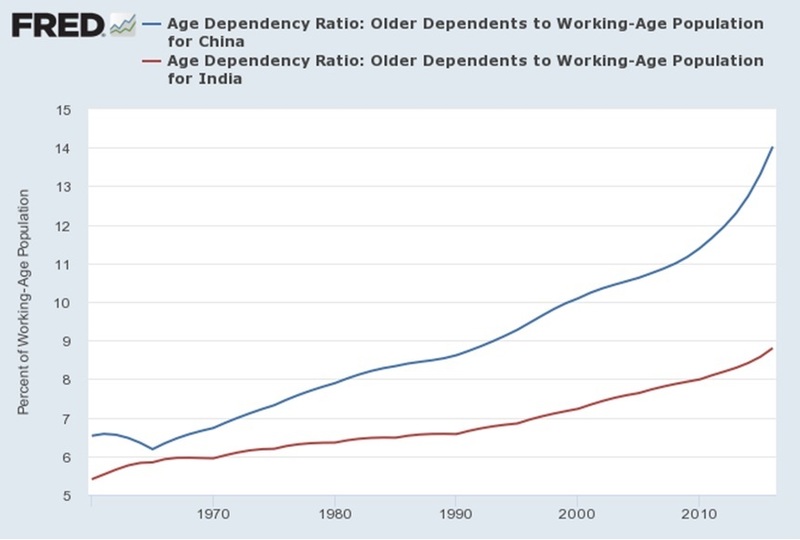 For India, the key question is how to help its large and growing working-age population be economically productive, before India's age-dependency ratio rises, too. "We found that suicide rates were rising. That opened another door: What about mortality in general? That’s when we found that mortality among whites in middle age was actually increasing. That came as a surprise to us, so we tried it out on friends of ours at medical schools. We thought this result must be known to them, or others, but it came as a surprise to basically everyone we showed these results to. "So we drilled into it and found it wasn’t that heart disease was increasing, it wasn’t that cancers were increasing. It turned out that the largest increases were for suicide, alcohol-related liver mortality and drug overdose, which we combined into what we called “deaths of despair.” Because to us it all seems like suicide; it’s either quickly with a gun or it’s slowly with drugs and alcohol. ... [This is a] narrow demographic in terms of being white, non-Hispanic, yes, but it is throughout middle age. It’s happening for people in their 20s and their 30s, 40s and 50s. ... The group that’s being hammered is people with less than a bachelor’s degree, more specifically, people with a high school degree or less. Those groups are at highest risk of those deaths. "None of that would’ve come to light if we had continued to make progress against heart disease in the U.S. Unlike other rich countries where mortality rates from heart disease are falling, they flat-lined in the U.S. We don’t really understand why. Some people are saying, `We’ve been telling you for two decades that you’re all getting fat and that eventually obesity will catch up with you.' But that’s a little bit premature, we think, because in Britain, the obesity rates are almost as high as they are in the U.S., and yet their heart disease rates continue to fall. So it’s something of a mystery. If heart disease progress had continued, it would’ve overwhelmed the increases we’ve seen in drugs and alcohol and suicide. But given that it’s flat-lined, it’s allowed those deaths to actually cause mortality rates to rise. We don’t fully have a picture of why this has happened even though the National Institutes of Health are spending $30 billion annually on health research and as a country we are spending $3 trillion a year on health care. "Coming to the policy part of this, we think that, while it’s not an easy thing to do, it’s relatively easy to turn off the taps for the prescription opioids, which are out of control. I think that a consensus is building for this, despite a lot of push-back from medical doctors who will say, `You come to my clinic, you look at these people who are in horrible pain and you tell me not to prescribe them something that can actually relieve their pain.' Well, we understand there’s a place for prescription opioids, but we think that they’re not currently being prescribed at an appropriate level. The fact that at current levels, every adult in the U.S. could be taking opioids around the clock for three weeks is more than probably makes any sense at all. "But when prescription opioids become too expensive or when the tap is turned off, that won’t entirely solve it. The same receptors in the brain respond to heroin, which is now coming in from Mexico, and it’s pure and cheap. Dealers don’t want to have to tangle with gangs in the inner cities, but they will deliver it to rural Maine and to Indiana, and that has made the illegal opioid crisis much worse as well. Talking about drugs is like trying to shoot at a moving target. In 2010, it was the prescription opioids; now it’s heroin and fentanyl." "In this part of KwaZulu-Natal and also in the Cape Flats outside of Cape Town, where we also had a field site, funerals are extremely expensive. ... In this part of Zululand, probably the only business that was thriving was the funeral business. ... When a baby dies, or a child at a very young age, there would be a traditional funeral. You would wrap them in a blanket and put them in the ground, and there’d be cookies and tea. When poor people died in old age, they would have an old-age funeral policy that would pay for their funerals; they pay in every month a little bit of money, and that takes care of funeral expenses. "But when people started to die in middle age, from AIDS, they didn’t have funeral policies to cover expenses. But the household felt compelled to bury them according to whatever their station was. For men, you would slaughter a cow. That’s a very expensive proposition. For women, you would slaughter a goat—less expensive but still a big chunk of change. There would be food for the extended family, who would come from far and wide, and stay as long as they wanted to stay. And you would have to feed them for as long as they wanted to stay. "It was also impossible for local areas to say, `OK, we’re going to make a pact in this local area: No one has an expensive funeral,' because your family who is coming all the way from Johannesburg, they didn’t buy into that. They wanted to come and have this enormous party. It was very important to be able to do that. ... And if you couldn’t afford to bury your dead according to the status of that person, you would borrow money, and as a last resort you would borrow from a money lender at uxorious rates. "So then these households would fall into a deep hole because they couldn’t get out of the loan they had taken out to pay for the funeral. We were able to document the extent to which further bad things happened in those households, whether or not children went hungry, whether or not children got to school, whether or not people reported more psychological stress than would’ve been caused just by the death of someone in the household. In those households that borrowed money, things got worse very quickly." "I think that women in economics oftentimes find that government work is one in which there’s more teamwork and their skills are fully recognized. A lot of women go into government instead of academia because when they look around they think, this is actually an environment that seems pretty healthy. And I think that it’s not the case that economics is altogether a healthy discipline for women. "My first graduate degree was in public policy, and all during my undergraduate years where I studied math and economics, and in public policy school, I never felt one whit of discrimination. But the minute I started a Ph.D. in economics, it was apparent. That was a long time ago now, but from that day until today, I have felt that if I want to be heard, I have to be willing to come in and be ready to fight, with sharp elbows." The US dollar is sometimes called the world's "reserve currency," which is true enough, but doesn't actually capture the multiple ways in which firms and nations around the world make use of the US dollar. Moreover, these other issues can complicate how other nations are affected by changes in the foreign exchange value of the US dollar. Fernando Eguren Martin, Mayukh Mukhopadhyay and Carlos van Hombeeck lay out these issues in "The global role of the US dollar and its consequences," published in the Bank of England Quarterly Bulletin (2017, Q4). Movements in the foreign exchange value of the US dollar of course affect US imports and exports: specifically, a stronger US dollar tends to boost imports (a stronger US dollar buys relatively more) and to weaken exports (a stronger US dollar pushes up relative costs of US producers). But changes in US dollar exchange rates percolate through the world economy in a number of other ways, too. 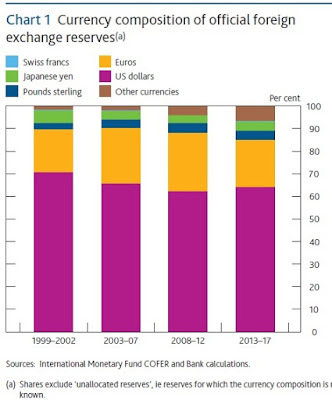 For example, central banks around the world hold "official" currency reserves, and they are mostly in US dollars. Most international borrowing also happens in US dollars, which means that those in other countries need to repay that borrowing in US dollars, which runs a risk of being difficult if there is a shift in US dollar exchange rates. 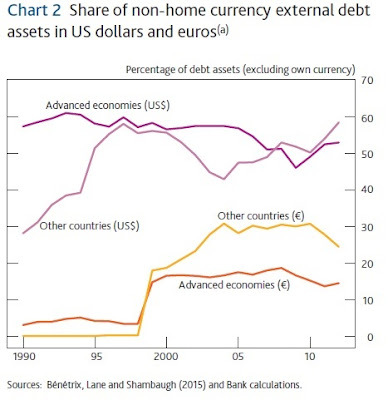 For example, here's a figure of total currency debt not in a nation's home currency. Although euro-denominated debt has made a surge, my suspicion is that it largely replaced previous debt that had been in German marks, French francs, and the like. The share of US dollar-denominated debt is about the same as it was in the mid-1990s. 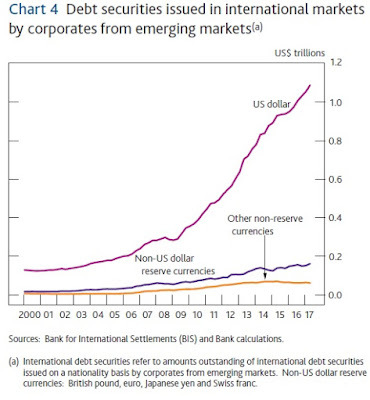 Similarly, when firms in emerging markets issue debt, they are most likely to do so in US dollars. 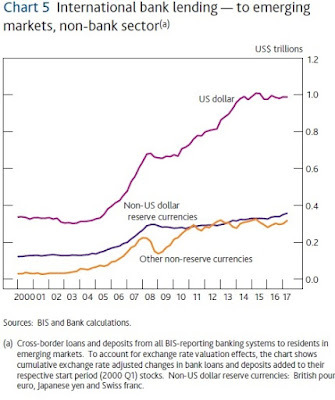 International bank lending to the non-bank sector in emerging markets is also mainly done in US dollars. "[There is an additional dimension to be considered given the large amount of US dollar-invoiced trade between non-US countries. Changes in the value of the US dollar could have different effects on countries depending on their shares of US dollar-invoiced exports and imports. Export and import prices are often slow to change in their currency of invoicing. For example, exporters may care about their competitors’ prices when they choose their own prices and so they keep these unchanged even when the exchange rate moves. Instead, mark-ups (the difference between the cost of producing the good or service and the selling price) fluctuate in tandem with the exchange rate. For example, Brazilian exporters to the United Kingdom do not necessarily lower the US dollar price they charge for their exports as the Brazilian real depreciates, even though their costs have gone down when measured in US dollars. Moreover, the cost of producing exports may increase to the extent that exporting firms use US dollar-denominated imported inputs in production." "We find that periods of US dollar appreciation are typically associated with below-average output growth in the rest of the world, in contrast to the boost we might normally expect through the standard trade channel. This is true for both advanced and emerging market economies." One should be hesitant about drawing unhedged conclusions that a strong US dollar will necessarily make other countries worse off: there are many other potentially confounding factors going on in the world economy. But these connections do suggest that as the Federal Reserve continues to slowly raise US interest rates, which will tend to make the US dollar more attractive and to increase its value, there may be some unwelcome spillover effects for financial systems in other countries. The label of "single-payer" health care tends to hide the reality that many choices would still need to be made. For example, a "single payer" plan could involve the government providing a voucher for a standardized health insurance plan, or it could offer choices between insurance plans provided by private firms. It could involve supplementary private health insurance: for example, the single-payer Medicare plan is often supplemented with "Medi-gap" private policies. A "single payer" plan could be funded out of general tax revenues, or by charging insurance premiums that might vary by age or in some other way. A "single payer" plan might have have most health care providers as government employees, or as employees of private firms. A "single-payer" plan could be run at the national level, or at a regional or state-by-state level. It could involve the same price-and-payment structure across the country, or allow for substantial variations across areas. The eminent health care economist Victor R. Fuchs, who is acutely aware of these distinctions and many others, nonetheless tackles the question in "Is Single Payer the Answer for the US Health Care System?" in a "Viewpoint" essay for the Journal of the American Medical Association (published online December 18, 2017). He focuses on how single payer might affect three outcomes: the number of uninsured, US health outcome, and the cost of health care. "Regarding the uninsured, single payer in almost any form could achieve universal health care insurance coverage. But so could many less-comprehensive reforms. Despite the success of the ACA [Affordable Care Act] in increasing the number of individuals in the US who have health insurance, approximately 25 million US residents remain uninsured. Universal coverage requires (1) subsidies for individuals who are too poor or too sick to acquire insurance at actuarial correct premiums, and (2) compulsion (ie, a mandate) for everyone else to participate and implicitly contribute to the subsidies. No country achieves universal coverage without subsidies and compulsion. The United States could achieve universal coverage relatively promptly if it were willing to adopt these 2 principles. Public attitudes toward subsidies and compulsion have been assessed by analyzing answers to a Pew Research Center survey of the US population, which included almost 2000 adults. A modest majority favored subsidies only, and a modest majority favored compulsion only. There was not, however, a majority who favored subsidies and compulsion." On the issue of whether single-payer would improve health outcomes, Fuchs points out: "Single payer might improve health outcomes by providing more equal access to medical care, but attention to the social determinants of health might be a more effective way to improve health." I've pointed out some of this evidence, as well as evidence on what appears to be a large degree of wastefulness in US healthcare spending, in "US Health Care: The Case for Going Upstream" (March 15, 2017). "The fragmented financing system is one of the principal explanations for the high cost of medical care in the United States. A careful consolidation of financing into some form of single-payer system is probably the only feasible solution. But single payer is easier said than done." For example, a "single-payer" system which is run on a state-by-state basis, while offering choices between insurance plans offered by private sector firms and the possibility for buying private supplementary insurance, while purchasing from dispersed private-sector providers of health care, would be less likely to offer cost savings. "The well-known 2014 and 2017 rankings by the Commonwealth Fund, for example, placed Canada 10th and then 9th out of 11 peer nations, slightly north of the United States, which has consistently come last. Those rankings reflect structural weaknesses in organization and finance that bedevil all the subnational Canadian plans, as reviewed extensively in a recent federal report. Policy analysts have repeatedly cited limited integration as the key flaw in systems that have a payment architecture largely mired in the 1970s. However, integration is limited by the absence of intermediaries, such as US integrated delivery systems or accountable care organizations. Medical associations, in particular, have representation rights to bargain directly with provincial governments, and, despite arguments that alignment of incentives would be in mutual interest, resist consolidation of medical budgets with other health care services. So difficult has it been to modernize Canadian Medicare that a 2013 scholarly monograph focused solely on the causes of the “Paradigm Freeze” in health care policy." None of this is to say that the US health care system doesn't have some lessons to learn from the Canadian system, as well as the German, Swiss, Dutch, and other systems. But just saying "single payer" doesn't address the wide differences in what Americans want from health insurance and health care, or the wide differences in the quantity and cost of health care provided across states, regions, and urban/rural areas. If the US health care system is crossword puzzle, "single payer" is one word in the puzzle--with the remainder still needing to be filled in. Aaron Steelman has an "Interview" with Douglas Irwin in the Econ Focus journal published by the Federal Reserve Bank of Richmond (2017, Third Quarter, pp. 20-25). "I distinctly remember being in my Chicago office in 1995 when Michael Bordo gave me a call (email was still a novelty) and asked if I would write a paper on U.S. trade policy during the Great Depression. I really hadn’t worked much on U.S. trade policy up to that point, though I had the latent interest. I thought it would be a really easy paper to write because I assumed that there would be a large literature on trade policy during the Great Depression. But when I did my literature survey I discovered — to my horror — that there was almost nothing really analytical on the period. So I actually had to write something like five background papers just to write this one conference volume paper. After that, I started doing a lot of analytical and empirical work on various episodes in U.S. trade policy history. Once I had written enough papers, it became obvious that I really ought to synthesize them and turn it into a book. That was around 2000. After various delays, I came close to finishing the book in 2006, but then 2007 came, and like many economists, my work got diverted by the financial crisis and I returned to looking at issues related to the Great Depression. After more delays, I finally got back to the book around 2013 and pushed it through to completion. ... The last major book of this sort was The Tariff History of the United States by Frank Taussig. It’s a great book, a classic, but it’s been a long time since his last edition." "Under the Articles of Confederation, Congress did not have the power to levy taxes. The federal government was broke and couldn’t pay its bills, leading the country toward a crisis. So one of the major reasons for the Constitutional Convention was to give Congress the power to raise revenue. The Tariff Act of 1789 was really just a revenue measure to pay debts and to finance the spending of the federal government. Revenue remains the major issue in trade policy through the antebellum era. ... There was a consensus among the Founders that it was the most efficient way of raising public funds as well as the most politically acceptable. Consider sales taxes in the early post-colonial period. They were very controversial and very costly to enforce; just think of the Whiskey Rebellion. An income tax just doesn’t make sense at this time for many reasons. But imports were coming into a relatively small number of ports, such as Boston, New York, Philadelphia, Baltimore, and Charleston. So it makes sense that if you have a lot of goods coming into a small number of places, you just tax them right there, which is pretty easy to do. In addition, people don’t easily see the tax because it’s built into the consumer price, so there is less political resistance to it." "I think the tariff issue had very little, if anything, to do with the Civil War. After the 1828 Tariff of Abominations, South Carolina essentially said we’re not going to enforce this law and we may withdraw from the union unless the policy is changed. That precipitated a real crisis, and it was defused with the Compromise of 1833 proposed by Henry Clay, which gradually reduced tariffs. From 1833 until the Civil War, tariffs were basically on a downward path. We reduced the tariff further in 1846 and then again in 1857. A year before the Civil War, the average tariff was below 20 percent, which was about the lowest it had been in the entire antebellum period. So the South and the Democrats really held the cards in terms of trade policy right up to the Civil War." Did tariffs help growth in the 19th century US economy? "Did protectionism foster U.S. economic growth and development in the late 19th century? I’m not convinced that we can attribute America’s industrial advance in the 19th century to high tariffs or protection. There are a couple points to make on this. ... A lot of the industrialization occurred prior to the Civil War, between 1840 and 1860 when we had low and declining tariffs. ... In addition, there are so many other things going on. We had open immigration, so there was a lot of growth in the labor force. We revamped our banking laws during the Civil War, finance became very important, and we got capital deepening. That’s not because of the tariff; that’s because the whole financial system of the United States was really developing. Another point to be made is that when you look at the high productivity growth sectors in the U.S. economy in the late 19th century, John Kendrick and others have shown they’re mostly in the non-traded goods, service sector. Transportation and utilities were growing very rapidly. It’s hard to see how the tariff would help the nontraded goods, service sector of the economy improve its performance. Also, Steve Broadberry has done some work showing that increasing productivity in the service sector was very important to the United States catching up with Britain in the late 19th century. That, too, doesn’t seem to be tariff related. All of this doesn’t lend itself to an easy story where the tariffs are the key factor behind U.S. growth and industrialization." Did Smoot-Hawley contribute in a major way to the Great Depression? "I would say most economists have been skeptical of the claim that the Hawley-Smoot Tariff led to the Great Depression or even exacerbated it to any great extent." "When Donald Trump was elected, given his extreme rhetoric on trade, many people expected big changes in trade policy. ... If you listen to the rhetoric, it might be reasonable to think that there is a big shift coming for U.S. trade policy. But I also noted that if you look back over the past 250 years, you see that we have had these periods where trade policy sort of veers off and then eventually returns to the old status quo. For example, Democratic President Woodrow Wilson slashed tariffs dramatically and tried to introduce much freer trade, but the Congress soon reimposed high tariffs when the Republicans were returned to power. When you look at what Franklin Roosevelt did with the RTAA [Reciprocal Trade Agreements Act], the introduction of trade agreements was a policy of evolution not an overnight revolution. The Reagan administration imposed a lot of protectionist measures in the 1980s, but those restrictions soon faded away. "As a result, I try to suggest in the book’s conclusion that there’s still a lot of status quo bias in the system. We can’t always believe the strong rhetoric, and maybe things won’t change as much as promised. And so far, as of August 2017, I think Trump hasn’t changed much in terms of U.S. trade policy. Yes, he pulled out of the Trans-Pacific Partnership, but maybe Hillary Clinton would have done so also; Bernie Sanders too. Trump did say he wanted to renegotiate bilateral agreements with these countries. There’s no evidence we’ve moved forward with that but that’s at least saying that he’s open to the idea of trade agreements. He hasn’t pulled out of the North American Free Trade Agreement (NAFTA), although the renegotiation of it is not likely to go well. He might go after China a bit, but consider his announcement: He signed an executive order for the USTR not to initiate an investigation but to look into initiating an investigation. So there’s nothing there yet." 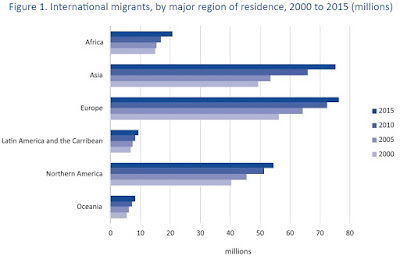 International migration is one of the hot-button subjects everywhere. The World Migration Report 2018 from the International Organization for Migration (the UN Migration Agency) provides a wealth of facts and background not just about the economics, which is my focus here, but also about regional aspects of migration, international frameworks governing migration, media coverage of migration, how potential migrants perceive their choices, and more. Here's a table showing total international migration over time. 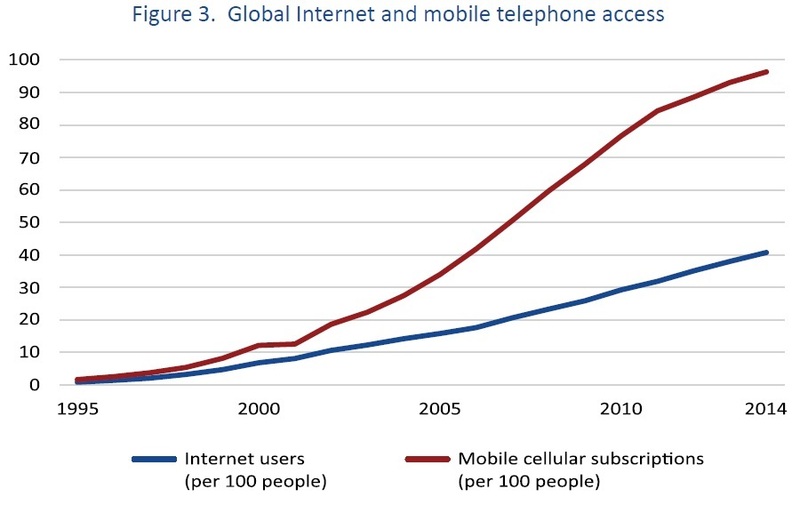 The absolute numbers have risen considerably, but the rise when viewed as a share of global population looks smaller. "In regard to the distribution of international migrants by countries’ income group, about two thirds of international migrants resided in high-income economies in 2015 – around 157 million. This compares with 77 million foreign-born who resided in middle-income countries (about one third of the total migrant stock) and almost 9 million in low-income countries in the same year." "In addition to benefiting individual migrants and their families, there is a large research literature that evidences the wider beneficial effects that emigration can have for migrants’ countries of origin. Emigration can reduce unemployment and underemployment, contribute to poverty reduction, and – with the appropriate supportive policies – foster broader economic and social development in origin countries in a variety of ways. 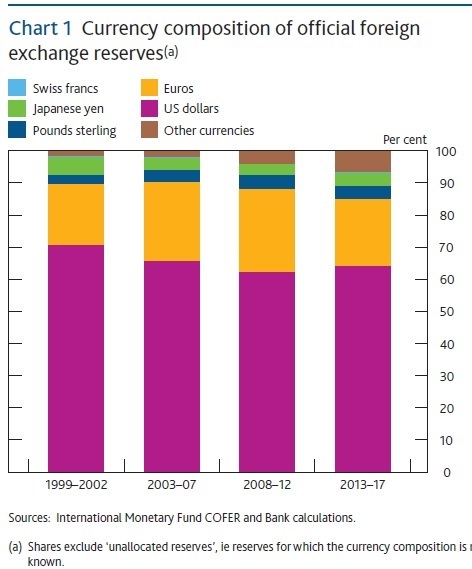 ... Remittances are generally a less volatile and more reliable source of foreign currency than other capital flows in many developing countries. According to the World Bank, in 1990 migrants remitted around USD 29 billion to lower- and middle-income countries in 1990. This amount had more than doubled to USD 74 billion in 2000 and reached USD 429 billion in 2016. Globally, remittances are now more than three times the amount of official development assistance. Migration can also result in the transfer of skills, knowledge and technology – effects that are hard to measure, but that could have considerable positive impacts on productivity and economic growth. Beyond these economic impacts, emigration can generate beneficial societal consequences for countries of origin, including poor and fragile States. For example, it is increasingly recognized that migrants can play a significant role in post-conflict reconstruction and recovery. "There is widespread agreement that migration can also generate economic and other benefits for destination countries. The precise nature and size of these benefits at a given time critically depends on the extent to which the skills of migrants are complementary to those of domestic workers, as well as on the characteristics of the host economy. In general, immigration adds workers to the economy, thus increasing the gross domestic product (GDP) of the host country. There are also a variety of ways in which migrants can have positive effects on labour productivity and GDP per head, e.g. if migrants are more skilled than national workers and/or if immigration has positive effects for innovation and skills agglomeration. By nature or necessity, migrants are often more likely to be risk takers, and this quality has led to enormous contributions to many destination countries in areas such as technology, science, the arts and a range of other fields. ... Immigration increases both the supply of and the demand for labour, which means that labour immigration (including of lower-skilled workers) can generate additional employment opportunities for existing workers. Of course, immigration can also have adverse labour market effects (e.g. on wages and employment of domestic workers), but most of the research literature finds that these negative impacts tend to be quite small, at least on average. Beyond the labour market and macroeconomy, the immigration of young workers can also help with easing pressures on pensions systems of high-income countries with rapidly ageing populations. Finally, in contrast to popular perceptions, a recent OECD study found that the net fiscal effects of immigration, i.e. the taxes migrants pay minus the benefits and government services they receive, tend to be quite small and – for most OECD countries analysed in the study – positive." My own sense of these arguments is that the case that migration offers very large benefits of migrants is extremely strong. The case that it benefits countries of origin is probably true, but with a lot of variation. For example, in an emerging market economy with good growth prospects, where people migrate, keep previous contacts, send remittances, and return now and then, migration can be a plus. However, in a low-income economy with poor growth prospects, where anyone who wants upward mobility feels a need to cut ties and leave, migration may not provide much benefit. The question of how migrants affect those in destination countries is most controversial of all. I tend to believe the evidence that there are overall gains, but the gains do not seem to be especially large, and there may well be some unwelcome distributional consequences. Much depends here on the specifics of how a nation implements its immigration policy. Improvements in the technology of transportation and communication seem likely to lead to pressures for additional migration in the future. 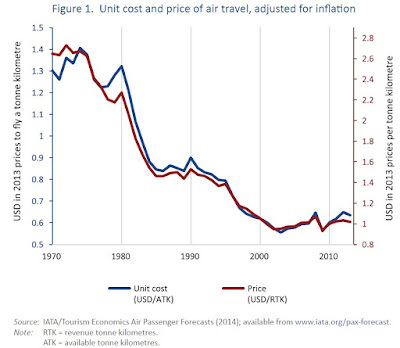 Consider three figures from the report, one showing a fall in costs of air transportation, one showing a rise in international tourism, and one showing a rise in internet and mobile phone use. 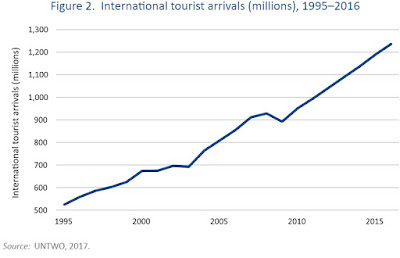 To the extent that barriers of transportation costs or lack of information have been barriers to international migration in the past, those barriers have been declining. 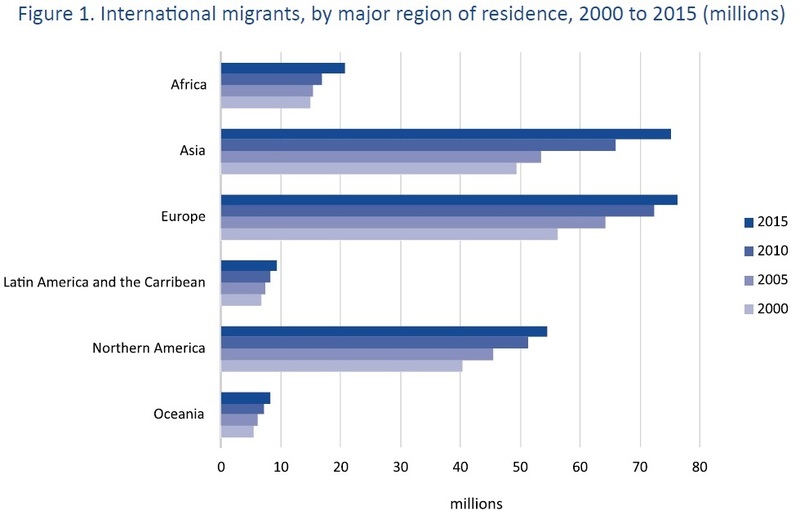 As I've argued on this blog in the past, it seems likely that the main hot spot for global migration in the next few decades will involve movement from African and the Middle East to nations of Europe. Population growth remains relatively high in many nations across Africa and the Middle East, while growth prospects are relatively low. There are many methods of finding out about immigration possibilities, many transportation routes, and a wealth of historical connections and groups of already-established migrants. 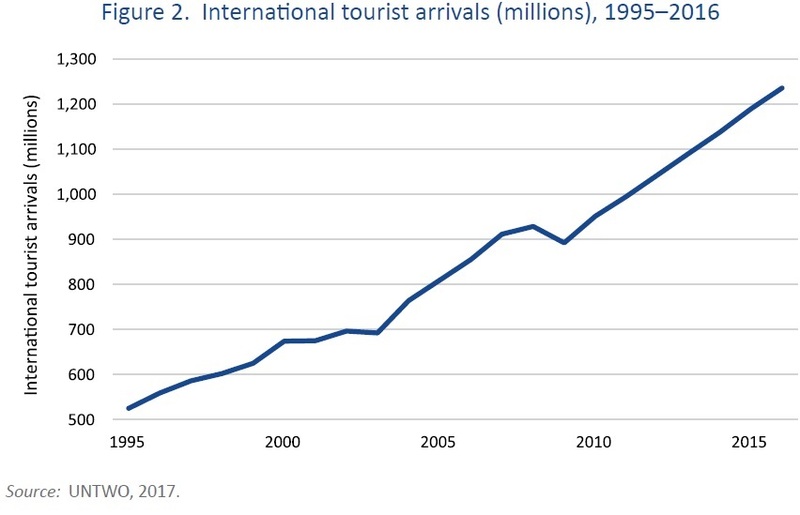 For the US, the enormous wave of immigrants from Mexico and other nations in Latin America has eased and even gone slightly into reverse; in fact, immigration to the US from China and India now exceeds that from Mexico. But I suspect that apprehensions across Europe about a rise in immigration are only just beginning. Giovanni Peri, "Immigrants, Productivity, and Labor Markets"
Christian Dustmann, Uta Schönberg and Jan Stuhler, "The Impact of Immigration: Why Do Studies Reach Such Different Results? Gordon Hanson and Craig McIntosh, "Is the Mediterranean the New Rio Grande? US and EU Immigration Pressures in the Long Run"
Michael A. Clemens, "Economics and Emigration: Trillion-Dollar Bills on the Sidewalk?" John Gibson and David McKenzie, "Eight Questions about Brain Drain"
Let's be clear: an "occupational license" means that if you don't have the license, you don't have government permission to do the job. If you do the job without such a license, you can be legally punished, even put in jail. "The share of American workers needing a license to work has climbed steadily in recent decades, from 1 in 20 workers in the 1950s to roughly 1 in 4 today ... Research suggests this growth is not primarily due to more workers leaving the farm and the factory for traditionally licensed fields like medicine and law. Instead, the main driver is new laws expanding licensing into previously unlicensed occupations." The IJ report looks at occupational licensing rules across states in a sample if 102 lower- and middle-wage occupations; that is, it doesn't look at occupational licensing in higher wage jobs like doctors, lawyers, teachers. Of these jobs that require occupational licenses, "[s]ome, such as family child care home operator, public school preschool teacher and non-instructional teacher assistant, cater to the needs of children. Others, like dental assistant, dietetic technician, optician and psychiatric worker, come from the health care sector. Still others represent the service sector and the construction and transportation trades. These include barber, bartender, cosmetologist, massage therapist, manicurist and skin care specialist; various contractor designations; and bus, taxi and truck driver. ... The list of 102 occupations includes some that are commonly licensed—and commonly recognized as such—including barber and cosmetologist, two ubiquitously and long-licensed occupations. Also on the list are many occupations that are generally familiar to the public, though the fact that they are licensed may not be. Such occupations include florist, funeral attendant, home entertainment installer, locksmith and upholsterer. Finally, there are some occupations on the list that are, along with their licenses, highly obscure: milk sampler, conveyor operator and dairy equipment still machine setter, for example." When you start looking at the state occupational licensing laws across these kinds of occupations, all sorts of inconsistency and strangeness becomes apparent. For example, Louisiana requires 500 hours of training get an occupational license to braid hair, and in 2012 had 32 hair-braiders in the state. Neighboring Mississippi has zero hours of required training, although it does require hair-braiders to register their business with the state, and had over 1,200 hair-braiders. As another example, Maryland doesn't license auctioneers, but the city of Baltimore does. "The city of Baltimore requires licenses or registrations for at least 26 occupations in addition to the 59 low- and middle-income occupations licensed by the state of Maryland. For example, Maryland is one of the 21 states that do not license auctioneers, but auctioneers in Baltimore must get a license from the city to work. And that license is relatively onerous, requiring $1,600 in licensing fees and either a one-year apprenticeship or an expensive training course." "EMTs hold lives in their hands, yet 73 other occupations have greater average licensure burdens. This includes barbers and cosmetologists, home entertainment installers, interior designers, log scalers, manicurists and numerous contractor designations. For perspective, while the average cosmetologist must complete 386 days of training, the average EMT must complete a mere 34. Even the average tree trimmer must complete more than 16 times the amount of education and experience as the average EMT." Locksmiths require a state license in 14 states. Opticians require a state license in 22 states. It seems unlikely that locks or eyes differ substantially across states. Thus, defenders of such licenses need to justify why they don't seem necessary in other states. ""On average, the 102 occupations studied here are licensed by just 27 states. Only 23 occupations are licensed by 40 states or more. Such inconsistency is suspect. The vast majority of these occupations are practiced in at least one state—and typically many more than one—without need of permission from the state and evidently without widespread harm." improving quality.Put differently, research suggests that consumers are paying more without getting better results." "We analyze the interstate migration of 22 licensed occupations. Using an empirical strategy that controls for unobservable characteristics that drive long-distance moves, we find that the between-state migration rate for individuals in occupations with state-specific licensing exam requirements is 36 percent lower relative to members of other occupations. Members of licensed occupations with national licensing exams show no evidence of limited interstate migration. The size of this effect varies across occupations and appears to be tied to the state specificity of licensing requirements. We also provide evidence that the adoption of reciprocity agreements, which lower re-licensure costs, increases the interstate migration rate of lawyers. Based on our results, we estimate that the rise in occupational licensing can explain part of the documented decline in interstate migration and job transitions in the United States." In another recent study, Brandon Pizzola and Alexander Tabarrok discuss "The Undertaker's License"
(Cato Institute Research Briefs in Economic Policy #91, December 2017). They focus on funeral directors in Colorado. It turns out that Colorado used to license funeral directors up until 1983, but then repealed the licensing rule. Thus, they can study Colorado's experience as a sort of natural experiment. They find that up to 1983, wages for funeral directors in Colorado were similar to the rest of the country, but by about 1990, they were 11% below the national average--which is roughly where they have remained since. Moreover, other prices associated with funerals also fell in Colorado, which is consistent a belief that as the funeral business became more competitive, there were ways to hold down the other costs as well. There is no evidence that funerals are somehow worse or of lower quality in Colorado than in other states. the underlying economic research paper here is Brandon Pizzola and Alexander Tabarrok, “Occupational Licensing Causes a Wage Premium: Evidence from a Natural Experiment in Colorado’s Funeral Services Industry,” International Review of Law and Economics 50 (2017): 50–59. The Institute for Justice and the Cato Institute are known for taking takes libertarian positions. Thus, in these partisan times, it seems worth noting that reform of occupational licensing is an issue with some bipartisan support. "When designed and implemented carefully, licensing can offer important health and safety protections to consumers, as well as benefits to workers. However, the current licensing regime in the United States also creates substantial costs, and often the requirements for obtaining a license are not in sync with the skills needed for the job. There is evidence that licensing requirements raise the price of goods and services, restrict employment opportunities, and make it more difficult for workers to take their skills across State lines. Too often, policymakers do not carefully weigh these costs and benefits when making decisions about whether or how to regulate a profession through licensing." "One out of every five Californians must receive permission from the government to work. For millions of Californians, that means contending with the hurdles of becoming licensed. Sixty years ago the number needing licenses nationally was one in 20. What has changed? What once was a tool for consumer protection, particularly in the healing arts professions, is now a vehicle to promote a multitude of other goals. These include professionalism of occupations, standardization of services, a guarantee of quality and a means of limiting competition among practitioners, among others. Many of these goals, though usually well intentioned, have had a larger impact of preventing Californians from working, particularly harder-to-employ groups such as former offenders and those trained or educated outside of California, including veterans, military spouses and foreign-trained workers. "In its study on occupational licensing, the Commission sought to learn whether the state properly balances consumer protection with ensuring that Californians have adequate access to jobs and services. It learned the state is not always maintaining this balance, as evidenced by discrepancies in requirements for jobs that pose similar risks to the consumer. Manicurists, for example, must complete at least 400 hours of education, which can cost thousands of dollars, and take a written and practical exam before becoming licensed. ... When government limits the supply of providers, the cost of services goes up. Those with limited means have a harder time accessing those services. Consequently, occupational licensing hurts those at the bottom of the economic ladder twice: first by imposing significant costs on them should they try to enter a licensed occupation and second by pricing the services provided by licensed professionals out of reach. The Commission found that over time, California has enacted a thicket of occupational regulation that desperately needs untangling in order to ease barriers to entering occupations and ensure services are available to consumers of all income levels." In the Trump administration, the Federal Trade Commission has been holding a series of roundtable conference to discuss the effects of occupational licensing, too. Often, the political wedge for dealing with occupational licensing issues seems to involve the plight of spouses in military families, who find that when they are transferred to a different state, they are unable to do their previous job without passing some additional costly and time-consuming occupational licensing test. But this issue is a lot broader than military families. With occupational licensing now covering one-fourth of all US jobs, it touches on the opportunities for jobs and upward mobility available to a very wide array of workers. When it seems important to take steps to assure quality of work, lots of other options are available, and occupational licensing should be used much more narrowly than it is. Do You Rejoice for China?